Author Colleen MacDonald shares trail tips and best practices from her bicycle trip guide. With summer in full swing, many people are dusting off their bicycles for a ride through town. 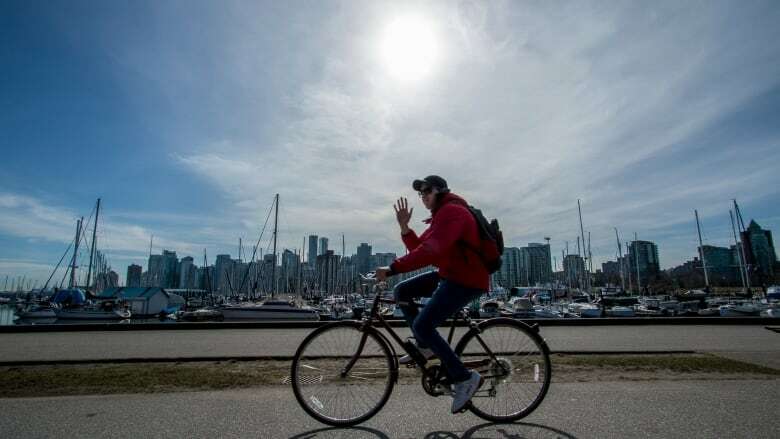 And for those looking for a refresher on best practices or day trip ideas, On The Coast host Gloria Macarenko spoke with Colleen MacDonald, author of Let's Go Biking: Easy Rides, Walks and Runs Around Vancouver. MacDonald says the book started eight years ago when her friends inquired about where they could go cycling with their kids. "So I put together 10 rides, made a little blog … and off they went," said MacDonald. "Well, as their kids grew the blog grew as the kids wanted to go on more and more rides, and pretty soon we were discovering coffee shops, lunch places, dinner places, all over the place." MacDonald says the appeal for her is meandering around town and finding new places to explore. Before you head out on the trails, MacDonald says the No. 1 thing to check is that your bike tires are pumped up as hard as you can get them. She also recommends setting your bike seat to a height that permits a good range of movement, and allows you to put a good amount of pressure on the foot pedals. "I've been on many bike rides where there's been a flat tire and we've had to walk back, so make sure you have a good repair kit and a first aid kit's pretty handy too, and besides that, you need a map," said MacDonald. Other essentials include a good helmet, sunscreen, energy bar, water, tire pump, spare tire, jacket, and a pannier bag to hold your gear. Cycling with children requires some extra diligence, according to MacDonald. That's why she takes routes away from auto traffic when she rides with her grandson. "I'm always looking for pathways that are easy and safe, so if he meanders a little bit off the trail that I know he's not going to be injured at all," she said. MacDonald has 84 maps in her book with routes that are safe and fun for families. One of her favourite routes — which might be a bit long for the little ones — starts at New Brighton Park in East Vancouver, heads over the Second Narrows Bridge, takes the North Shore Spirit Trail to Ambleside Park, and then crosses over the Lions Gate Bridge. She says the total distance of that trip is 32 kilometres, but trip times can vary as you take in the views and stop along the way. Some of her other favourite routes include the new Arbutus Greenway in Vancouver, the Fort to Fort Trail in Fort Langley, and riding any time of year along the Maple Ridge dykes.